a. With French Sudan, as the Mali Federation. Senegal ( /ˌsɛnɪˈɡɔːl,_ʔˈɡɑːl/; French: Sénégal), officially the Republic of Senegal (French: République du Sénégal [ʁepyblik dy seneɡal]), is a country in West Africa. Senegal is bordered by Mauritania in the north, Mali to the east, Guinea to the southeast, and Guinea-Bissau to the southwest. Senegal also borders The Gambia, a country occupying a narrow sliver of land along the banks of the Gambia river, which separates Senegal's southern region of Casamance from the rest of the country. Senegal also shares a maritime border with Cape Verde. Senegal's economical and political capital is Dakar. It is the westernmost country in the mainland of the Old World, or Afro-Eurasia, and owes its name to the Senegal River, which borders it to the east and north. The name "Senegal" comes from the Wolof "Sunuu Gaal," which means "Our Boat." Senegal covers a land area of almost 197,000 square kilometres (76,000 sq mi) and has an estimated population of about 13 million. The climate is Sahelian, but there is a rainy season. The territory of modern Senegal has been inhabited by various ethnic groups since the Prehistory. Organized kingdoms emerged around the seventh century, and parts of the country were ruled by prominent regional empires such as the Jolof Empire. The present state of Senegal has its roots in European colonialism, which began during the mid-15th century, when various European powers began competing for trade in the area. The establishment of coastal trading posts gradually led to control of the mainland, culminating in French rule of the area by the 19th century, albeit amid much local resistance. Senegal peacefully attained independence from France in 1960, and has since been among the more politically stable countries in Africa. Senegal's economy is centered mostly on commodities and natural resources. Major industries are fish processing, phosphate mining, fertilizer production, petroleum refining, construction materials, ship construction and repair. As in most African nations, agriculture is a major sector, with Senegal producing several important cash crops, including peanuts, sugarcane, cotton, green beans, tomatoes, melons, and mangoes. Owing to its relative stability, tourism and hospitality are also burgeoning sectors. A multiethnic and secular nation, Senegal is predominantly Sunni Muslim with Sufi and animist influences. French is the official language, although many native languages are spoken and recognized. Since April 2012 Senegal's president has been Macky Sall. Senegal has been a member of the Organisation internationale de la Francophonie since 1970. Senegal is named after the Senegal River, the etymology of which is contested. One popular theory (proposed by David Boilat in 1853) is that it stems from the Wolof phrase sunu gaal, which means "our canoe" (or pirogue), resulting from a miscommunication between 15th-century Portuguese sailors and Wolof fishermen. The "our canoe" theory has been popularly embraced in modern Senegal for its charm and its use in appeals to national solidarity (e.g. "we're all in the same canoe") are frequently heard in the media. Modern historians believe the name probably refers to the Sanhaja, Berbers who lived on the northern side of the river. A competing theory is that it derives from the medieval town of "Sanghana" (also spelled as Isenghan, Asengan, Singhanah), described by the Arab geographer al-Bakri in 1068 as located by the mouth of the river. Some Serer people from the south believe the river's name is derived from the compound of the Serer term Sene (from Roge Sene, Supreme Deity in Serer religion) and O Gal (meaning "body of water"). Archaeological findings throughout the area indicate that Senegal was inhabited in prehistoric times and has been continuously occupied by various ethnic groups. 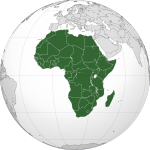 Some kingdoms were created around the 7th century: Takrur in the 9th century, Namandiru and the Jolof Empire during the 13th and 14th centuries. Eastern Senegal was once part of the Ghana Empire. Islam was introduced through Toucouleur and Soninke contact with the Almoravid dynasty of the Maghreb, who in turn propagated it. The Almoravids, with the help of Toucouleur allies, used military force for conversion. This movement faced resistance from ethnicities of traditional religions, the Serers in particular. In the 14th century the Jolof Empire grew powerful, having united Cayor and the kingdoms of Baol, Sine, Saloum, Waalo, Futa Tooro and Bambouk. The empire was a voluntary confederacy of various states rather than an empire built on military conquest. The empire was founded by Ndiadiane Ndiaye, a part Serer and part Toucouleur, who was able to form a coalition with many ethnicities, but collapsed around 1549 with the defeat and killing of Lele Fouli Fak by Amari Ngone Sobel Fall. Slave traders in Gorée, 18th century. European missionaries introduced Christianity to Senegal and the Casamance in the 19th century. It was only in the 1850s that the French began to expand onto the Senegalese mainland – they had abolished slavery and promoted an abolitionist doctrine-, adding native kingdoms like the Waalo, Cayor, Baol, and Jolof Empire. French colonists progressively invaded and took over all the kingdoms except Sine and Saloum under Governor Louis Faidherbe. Senegalese resistance to the French expansion and curtailing of their lucrative slave trade was led in part by Lat-Dior, Damel of Cayor, and Maad a Sinig Kumba Ndoffene Famak Joof, the Maad a Sinig of Sine, resulting in the Battle of Logandème. On 4 April 1959 Senegal and the French Sudan merged to form the Mali Federation, which became fully independent on 20 June 1960, as a result of the independence and the transfer of power agreement signed with France on 4 April 1960. Due to internal political difficulties, the Federation broke up on 20 August, when Senegal and French Sudan (renamed the Republic of Mali) each proclaimed independence. Léopold Sédar Senghor was proclaimed Senegal's first president in September 1960. Senghor was a very well-read man, educated in France. He was a poet, a philosopher and personally drafted the Senegalese national anthem, "Pincez tous vos koras, frappez les balafons". Pro-African, he advocated a brand of African socialism. In 1980, President Senghor decided to retire from politics. The next year, he transferred power in 1981 to his hand-picked successor, Abdou Diouf. Former prime minister Mamadou Dia, who was Senghor's rival, ran for election in 1983 against Diouf but lost. Senghor moved to France, where he died at the age of 96. Currently, Senegal has a quasi-democratic political culture, one of the more successful post-colonial democratic transitions in Africa. Local administrators are appointed by, and responsible to, the president. Marabouts, religious leaders of the various Muslim brotherhoods of Senegal, also exercise a strong political influence in the country especially during Wade's presidency. In 2009, Freedom House downgraded Senegal's status from 'Free' to 'Partially Free', based on increased centralisation of power in the executive. However, it has since recovered its Free status by 2014. In 2008, Senegal finished in 12th position on the Ibrahim Index of African Governance. The Ibrahim Index is a comprehensive measure of African governance (limited to sub-Saharan Africa until 2008), based on a number of different variables which reflect the success with which governments deliver essential political goods to their citizens. When the Northern African countries were added to the index in 2009, Senegal's 2008 position was retroactively downgraded to 15th place (with Tunisia, Egypt and Morocco placing themselves ahead of Senegal). As of 2012, Senegal's rank in the Ibrahim Index has decreased another point to 16 out of 52 African countries. On 22 February 2011, it was reported that Senegal had severed diplomatic ties with Iran, saying it supplied rebels with weapons which killed Senegalese troops in the Casamance conflict. Senegal is subdivided into 14 regions, each administered by a Conseil Régional (Regional Council) elected by population weight at the Arrondissement level. The country is further subdivided by 45 Départements, 103 Arrondissements (neither of which have administrative function) and by Collectivités Locales, which elect administrative officers. Senegal has a high profile in many international organizations and was a member of the UN Security Council in 1988-89. It was elected to the UN Commission on Human Rights in 1997. Friendly to the West, especially to France and to the United States, Senegal also is a vigorous proponent of more assistance from developed countries to the Third World. Senegal enjoys mostly cordial relations with its neighbors. In spite of clear progress on other fronts with Mauritania (border security, resource management, economic integration, etc. ), there remains the problem of an estimated 30,000 Afro-Mauritanian refugees living in Senegal. Landmines were widely used in the Casamance conflict between separatist rebels and the central government. The Senegalese armed forces consist of about 19,000 well-trained and disciplined personnel in the army, air force, navy, and gendarmerie. The Senegalese military force receives most of its training, equipment, and support from France and the United States. Germany also provides support but on a smaller scale. Senegal map of Köppen climate classification. The Senegalese landscape consists mainly of the rolling sandy plains of the western Sahel which rise to foothills in the southeast. Here is also found Senegal's highest point, an otherwise unnamed feature near Nepen Diakha at 584 m (1,916 ft). The northern border is formed by the Senegal River, other rivers include the Gambia and Casamance Rivers. The capital Dakar lies on the Cap-Vert peninsula, the westernmost point of continental Africa. A proportional representation of Senegal's exports. After its economy contracted by 2.1 percent in 1993 Senegal instituted a major economic reform program with the support of international donors. This reform began with a 50 percent devaluation of the country's currency (the CFA franc). Government price controls and subsidies were also dismantled. As a result, Senegal's inflation went down, investment went up, and the gross domestic product rose approximately 5 percent per year between 1995 and 2001. The main industries include food processing, mining, cement, artificial fertilizer, chemicals, textiles, refining imported petroleum, and tourism. Exports include fish, chemicals, cotton, fabrics, groundnuts, and calcium phosphate. The principal foreign market is India at 26.7 percent of exports (as of 1998). Other foreign markets include the United States, Italy and the United Kingdom. Senegal has a 12-nautical-mile (22 km; 14 mi) exclusive fishing zone that has been regularly breached in recent years (as of 2014). It has been estimated that the country's fishermen lose 300,000 tonnes of fish each year to illegal fishing. The Senegalese government have tried to control the illegal fishing which is conducted by trawlers, some of which are registered in Russia, Mauritania, Belize and Ukraine. In January 2014 a Russian trawler, Oleg Naydenov, was seized by Senegalese authorities close to the maritime border with Guinea-Bissau. Senegal realized full Internet connectivity in 1996, creating a mini-boom in information technology-based services. Private activity now accounts for 82 percent of its GDP. On the negative side, Senegal faces deep-seated urban problems of chronic high unemployment, socioeconomic disparity, and juvenile delinquency. Senegal is a major recipient of international development assistance. Donors include the United States Agency for International Development (USAID), Japan, France and China. Over 3000 Peace Corps Volunteers have served in Senegal since 1963. Senegal's population from 1962 to 2004. Senegal has a population of over 13.5 million, about 42 percent of whom live in rural areas. Density in these areas varies from about 77 inhabitants per square kilometre (200 /sq mi) in the west-central region to 2 per square kilometre (5.2 /sq mi) in the arid eastern section. About 50,000 Europeans (mostly French) and Lebanese as well as smaller numbers of Mauritanians and Moroccans reside in Senegal, mainly in the cities and some retirees who reside in the resort towns around Mbour. The majority of Lebanese work in commerce. Also located primarily in urban settings are small Vietnamese communities as well as a growing number of Chinese immigrant traders, each numbering perhaps a few hundred people. There are also tens of thousands of Mauritanian refugees in Senegal, primarily in the country's north. A street market in Malem-Hodar. French is the official language, used regularly by a minority of Senegalese educated in a system styled upon the colonial-era schools of French origin (Koranic schools are even more popular, but Arabic is not widely spoken outside of this context of recitation). Most people also speak their own ethnic language while, especially in Dakar, Wolof is the lingua franca. Pulaar is spoken by the Fulas and Toucouleur. The Serer language is widely spoken by both Serers and non-Serers (including president Sall, whose wife is Serer); so are the Cangin languages, whose speakers are ethnically Serers. Jola languages are widely spoken in the Casamance. Several of the Senegalese languages have the legal status of "national languages": Balanta-Ganja, Hassaniya Arabic, Jola-Fonyi, Mandinka, Mandjak, Mankanya, Noon (Serer-Noon), Pulaar, Serer, Soninke, and Wolof. Portuguese Creole, locally known as Portuguese, is a prominent minority language in Ziguinchor, regional capital of the Casamance, spoken by local Portuguese creoles and immigrants from Guinea-Bissau. The local Cape Verdean community speak a similar Portuguese creole, Cape Verdean Creole, and standard Portuguese. Portuguese was introduced in Senegal's secondary education in 1961 in Dakar by the country's first president, Léopold Sédar Senghor, it is currently available in most of Senegal and in higher education. It is especially prevalent in Casamance as it relates with the local cultural identity. French, the only official language in the country, is facing a backlash as a consequence of a rising Senegalese linguistic nationalist movement, which supports the integration of Wolof, the common vernacular language of the country, into the national constitution. Senegal is a secular state. Islam is the predominant religion in the country. Islam is practiced by approximately 94% of the country's population; the Christian community, at 5% of the population, are mostly Roman Catholics but there are still diverse Protestant denominations. One percent have animist beliefs, particularly in the southeastern region of the country. Some Serer people follow the Serer religion. The Great Mosque of Touba, home of the Mouride Sufi brotherhood, it is also one of the finest examples of Islamic architecture in Africa. Majority of the Muslims in Senegal are Sunni with Sufi influences. Islamic communities in Senegal are generally organized around one of several Islamic Sufi orders or brotherhoods, headed by a khalif (xaliifa in Wolof, from Arabic khalīfa), who is usually a direct descendant of the group's founder. The two largest and most prominent Sufi orders in Senegal are the Tijaniyya, whose largest sub-groups are based in the cities of Tivaouane and Kaolack, and the Murīdiyya (Murid), based in the city of Touba. 27% are nondenominational Muslims. The spread of formal Quranic school (called daara in Wolof) during the colonial period increased largely through the effort of the Tidjâniyya. In Murid communities, which place more emphasis on the work ethic than on literary Qu'ranic studies, the term daara often applies to work groups devoted to working for a religious leader. Other Islamic groups include the much older Qādiriyya order and the Senegalese Laayeen order, which is prominent among the coastal Lebu. Today, most Senegalese children study at daaras for several years, memorizing as much of the Qur'an as they can. Some of them continue their religious studies at councils (majlis) or at the growing number of private Arabic schools and publicly funded Franco-Arabic schools. A modern messianic sect in Islam, the Ahmadiyya Muslim Community is also present in the country which represents approximately 1% of the Muslim population. There are small numbers of adherents of Judaism and Buddhism. Judaism is followed by members of several ethnic groups, while Buddhism is followed by a number of Vietnamese. The Bahá'í Faith in Senegal was established after 'Abdu'l-Bahá, the son of the founder of the religion, mentioned Africa as a place that should be more broadly visited by Bahá'ís. The first Bahá'is to set foot in the territory of French West Africa that would become Senegal arrived in 1953. The first Bahá'í Local Spiritual Assembly of Senegal was elected in 1966 in Dakar. In 1975 the Bahá'í community elected the first National Spiritual Assembly of Senegal. The most recent estimate, by the Association of Religion Data Archives in a 2005 report details the population of Senegalese Bahá'ís at 22,000. Life expectancy by birth is estimated to 57.5 years. Public expenditure on health was at 2.4 percent of the GDP in 2004, whereas private expenditure was at 3.5 percent. Health expenditure was at US$72 (PPP) per capita in 2004. The fertility rate ranged 5 to 5.3 between 2005 and 2013, with 4.1 in urban areas and 6.3 in rural areas, as official survey (6.4 in 1986 and 5.7 in 1997) point out. There were 6 physicians per 100,000 persons in the early 2000s (decade). Infant mortality was at 77 per 1,000 live births in 2005, but in 2013 this figure had dropped to 47 within the first 12 months after birth. In the past 5 years infant mortality rates of malaria have dropped. According to a 2013 UNICEF report, 26% of women in Senegal have undergone female genital mutilation. The African Renaissance Monument built in 2010 in Dakar is the tallest statue in Africa. Because Senegal borders the Atlantic Ocean, fish is very important. Chicken, lamb, peas, eggs, and beef are also used in Senegalese cooking, but not pork, due to the nation’s largely Muslim population. Peanuts, the primary crop of Senegal, as well as couscous, white rice, sweet potatoes, lentils, black-eyed peas and various vegetables, are also incorporated into many recipes. Meats and vegetables are typically stewed or marinated in herbs and spices, and then poured over rice or couscous, or eaten with bread. Popular fresh juices are made from bissap, ginger, buy (pronounced 'buoy', which is the fruit of the baobab tree, also known as "monkey bread fruit"), mango, or other fruit or wild trees (most famously soursop, which is called corossol in French). Desserts are very rich and sweet, combining native ingredients with the extravagance and style characteristic of the French impact on Senegal’s culinary methods. They are often served with fresh fruit and are traditionally followed by coffee or tea. Senegal is known across Africa for its musical heritage, due to the popularity of mbalax, which originated from the Serer percussive tradition especially the Njuup, it has been popularized by Youssou N'Dour and others. Sabar drumming is especially popular. The sabar is mostly used in special celebrations like weddings. Another instrument, the tama, is used in more ethnic groups. Other popular international renown Senegalese musicians are Ismael Lô, Cheikh Lô, Orchestra Baobab, Baaba Maal, Akon Thione Seck, Viviane, Titi and Pape Diouf. Hospitality, in theory, is given such importance in Senegalese culture that it is widely considered to be part of the national identity. The Wolof word for hospitality is "teranga" and it is so identified with the pride of Senegal that the national football team is known as the Lions of Teranga. Football is a popular sport in Senegal. In 2002, the team finished as runners-up at the Africa Cup of Nations and became one of only three African teams to ever reach the quarter-finals of the FIFA World Cup, defeating holders France in their first game. Popular players of this team included El-Hadji Diouf, Papa Bouba Diop, Khalilou Fadiga and Henri Camara, all of whom played in Europe. Basketball is also a popular sport in Senegal. The country has traditionally been one of Africa's dominant basketball powers. The men's team performed better than any other African nation at the 2014 FIBA World Cup, where they reached the playoffs for the first time. The women's team won 19 medals at 20 African Championships, more than twice as many medals as any competitor. The country hosted the Paris–Dakar rally from 1979 until 2007. ^ a b c d e f Central Intelligence Agency (2009). "Senegal". The World Factbook. https://www.cia.gov/library/publications/the-world-factbook/geos/sg.html. Retrieved 12 October 2015. ^ a b c d "Senegal". International Monetary Fund. http://www.imf.org/external/pubs/ft/weo/2015/02/weodata/weorept.aspx?sy=2015&ey=2016&scsm=1&ssd=1&sort=country&ds=.&br=1&pr1.x=62&pr1.y=9&c=614%2C668%2C638%2C674%2C616%2C676%2C748%2C678%2C618%2C684%2C624%2C688%2C622%2C728%2C626%2C692%2C628%2C694%2C632%2C714%2C636%2C716%2C634%2C722%2C662%2C718%2C642%2C724%2C643%2C199%2C644%2C733%2C646%2C734%2C648%2C738%2C652%2C742%2C656%2C746%2C654%2C754%2C664%2C698%2C666&s=NGDPD%2CNGDPPC%2CNGDPDPC%2CPPPGDP%2CPPPPC&grp=0&a=. Retrieved 17 April 2013. ^ "Definition of Senegal". The Free Dictionary. http://www.thefreedictionary.com/Senegal. Retrieved 6 November 2013. ^ "Define Senegal". Dictionary.com. http://dictionary.reference.com/browse/Senegal. Retrieved 6 November 2013. ^ "Slavery", Encyclopædia Britannica's Guide to Black History Archived October 6, 2014 at the Wayback Machine. ^ ""Goree and the Atlantic Slave Trade", Philip Curtin, History Net, accessed 9 July 2008". H-net.org. http://www.h-net.org/~africa/threads/goree.html. Retrieved 20 June 2010. ^ "The Ibrahim Index » Mo Ibrahim Foundation". Moibrahimfoundation.org. Archived from the original on 29 December 2011. https://web.archive.org/web/20111229141051/http://www.moibrahimfoundation.org/en/section/the-ibrahim-index. Retrieved 3 January 2012. ^ "Macky Sall Senegal election win 'example for Africa' | Africa". World.myjoyonline.com. 26 August 2012. http://world.myjoyonline.com/pages/africa/201203/83756.php. Retrieved 25 November 2012. ^ "SENEGAL VOTES TO DO AWAY WITH SENATE TO SAVE MONEY". Associated Press. http://bigstory.ap.org/article/senegal-votes-do-away-senate-save-money. Retrieved 20 September 2012. ^ List of current local elected officials from Union des Associations d' Elus Locaux (UAEL) du Sénégal. See also the law creating current local government structures: (French) Code des collectivités locales, Loi n° 96-06 du 22 mars 1996. ^ "Senegal to send 2,100 troops to join Saudi-led alliance". Reuters. 4 May 2015. http://www.reuters.com/article/2015/05/04/us-yemen-saudi-senegal-idUSKBN0NP1N920150504. ^ a b "Constitution of Senegal (Article 1)". http://www.wipo.int/edocs/lexdocs/laws/en/sn/sn014en.pdf. Retrieved 4 August 2015. ^ "Public Anti-Corruption Initiatives". Business Anti-Corruption Portal. http://www.business-anti-corruption.com/country-profiles/sub-saharan-africa/senegal/show-all.aspx. Retrieved 27 March 2014. ^ "Dakar, Senegal Climate Information – ClimateTemp.info, Making Sense of Average Monthly Weather & Temperature Data with Detailed Climate Graphs That Portray Average Rainfall & Sunshine Hours". ClimaTemps.com. 22 July 2011. http://www.senegal.climatemps.com/. Retrieved 29 March 2012. ^ "Weather rainfall and temperature data". World Climate. http://www.worldclimate.com/. ^ "Peace Corps Senegal". Pcsenegal.org. http://www.pcsenegal.org. Retrieved 20 June 2010. ^ a b c (French) ANSD Retrieved 2013-12-10. ^ Phuong, Tran (9 July 2007). "Vietnamese Continue Traditions in Senegal". Voice of America. Archived from the original on 11 July 2007. https://web.archive.org/web/20070711163221/http://www.voanews.com/english/2007-07-09-voa19.cfm. Retrieved 27 August 2008. ^ Fitzsimmons, Caitlin (17 January 2008). "A troubled frontier: Chinese migrants in Senegal". South China Morning Post. http://www.caitlinfitzsimmons.com/wp-content/uploads/2008/01/caitlin1.pdf. Retrieved 31 March 2009. ^ "Boost for the reintegration of Mauritanian returnees". UNHCR News. 26 November 2008. http://www.unhcr.org/news/NEWS/492d41584.html. Retrieved 12 January 2010. ^ "World Refugee Survey 2008". U.S. Committee for Refugees and Immigrants. 19 June 2008. Archived from the original on 28 May 2010. https://web.archive.org/web/20100528032724/http://www.refugees.org/survey/. ^ José Horta (12–25 April 2006). "A Língua Portuguesa no Senegal". Instituto Camões. http://www.instituto-camoes.pt/encarte/encarte98a.htm. Retrieved 10 December 2014. ^ Pierre Cherruau (19 August 2012). "Le Sénégal est-il encore un pays francophone?". http://www.slateafrique.com/21377/linguistique-senegal-est-il-encore-un-pays-francophone. Retrieved 19 August 2012. ^ a b Agence Nationale de la Statistique et de la Démographie (2005). "Situation économique et sociale du Sénégal" (in French) (PDF). Government of Senegal. Archived from the original on 25 June 2008. https://web.archive.org/web/20080625002308/http://www.ansd.org/SES2005.pdf. Retrieved 18 November 2008. ^ Forsberg, Jan. "Cities in Senegal". http://popofcities.com/senegalCITY.htm. Retrieved 18 November 2008. ^ Conklin, Alice L. "A mission to civilize: the republican idea of empire in France and West Africa, 1895–1930." Stanford University Press, 1997. ISBN 0-8047-2999-9 p. 27. ^ Hans Bressers; Walter A. Rosenbaum (2003). Achieving Sustainable Development: The Challenge of Governance Across Social Scales. Greenwood Publishing Group. pp. 151–. ISBN 978-0-275-97802-0. https://books.google.com/books?id=SvAGAeQNo7oC&pg=PA151. ^ "The World's Muslims: Unity and Diversity". Pew Forum on Religious & Public life. August 9, 2012. http://www.pewforum.org/uploadedFiles/Topics/Religious_Affiliation/Muslim/the-worlds-muslims-full-report.pdf. Retrieved April 7, 2014. ^ 'Abdu'l-Bahá (1991) [1916–17]. Tablets of the Divine Plan (Paperback ed.). Wilmette, IL: Bahá'í Publishing Trust. pp. 47–59. ISBN 0-87743-233-3. http://reference.bahai.org/en/t/ab/TDP/tdp-8.html.iso8859-1. ^ Hassall, Graham (c. 2000). "Egypt: Baha'i history". Asia Pacific Bahá'í Studies: Bahá'í Communities by country. Bahá'í Online Library. http://bahai-library.com/asia-pacific/country%20files/egypt.htm. Retrieved 24 May 2009. ^ Bahá'í International Community (28 December 2003). "National communities celebrate together". Bahá'í International News Service. http://hfa01.news.bahai.org/story/283. ^ "Most Baha'i Nations (2005)". QuickLists > Compare Nations > Religions >. The Association of Religion Data Archives. 2005. http://www.thearda.com/QuickLists/QuickList_40c.asp. Retrieved 4 July 2009. ^ a b c d e "Human Development Report 2009 – Senegal". Hdrstats.undp.org. http://hdrstats.undp.org/en/countries/data_sheets/cty_ds_SEN.html. Retrieved 20 June 2010. ^ a b c "Senegal". 2005 Findings on the Worst Forms of Child Labor. Bureau of International Labor Affairs, U.S. Department of Labor (2006). This article incorporates text from this source, which is in the public domain. Archived January 9, 2014 at the Wayback Machine. ^ "Sports in Africa: Communication and Media". Ohio University. http://www.ohio.edu/sportsafrica/communicationmedia/ousmane.htm. ^ "Wrestling As a Solution to Poverty in Senegal". PRI. http://www.pri.org/stories/2011-06-09/wrestling-solution-poverty-senegal. This page uses content from the English language Wikipedia. The original content was at Senegal. The list of authors can be seen in the page history. As with this Familypedia wiki, the content of Wikipedia is available under the Creative Commons License.